Music of Japan Today examines cross-cultural confluences in contemporary Japanese art-music through multiple approaches from twenty international composers, performers, and scholars. Like the format of the MOJT symposia (1992-2007) held in the United States, the book is in two parts. In Part I, three award-winning Japanese composers discuss the construction of their compositional techniques and aesthetic orientations. Part II contains nineteen essays by scholars and creative musicians, arranged in a general chronological frame. 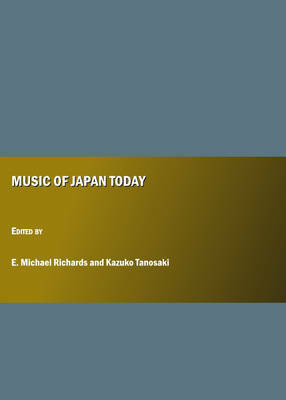 The first section discusses connections of the music and ideas of Japanese composers during the time surrounding the Second World War to Japan's politics; section two presents recent perspectives on the music and legacy of Japan's most internationally renowned composer, Toru Takemitsu (1930-96). Section three investigates innovative, cross-cultural uses of Japanese and Western instruments (grouped by common instrumental families - voice, flutes, strings), shaped by historical traditions, physical design, and acoustic characteristics and constraints. Section four examines computer music by mid-career composers, and the final section looks at four current Japanese societies, within and "off-shore" Japan, and their music: spirituality and wind band music in Japan, avant-garde sound artists in Tokyo, Japanese composers in the UK, and the role of cell phone ringtones in the Japanese music market.